We can use Arduino for processing MIDI input and use Virtual MIDI Piano Keyboard freeware on PC for testing purpose. MIDI controller is hardware or software which generates and transmits Musical Instrument Digital Interface (MIDI) data to electronic or digital MIDI-enabled device. We can directly connect the MIDI jack with Arduino with minimally complex wiring or use IC. We can program, create circuit to blink the LED connected to Pin 13 on the Arduino Board upon press of a note on a Midi Keyboard to confirm that we are receiving MIdI commands with Arduino. 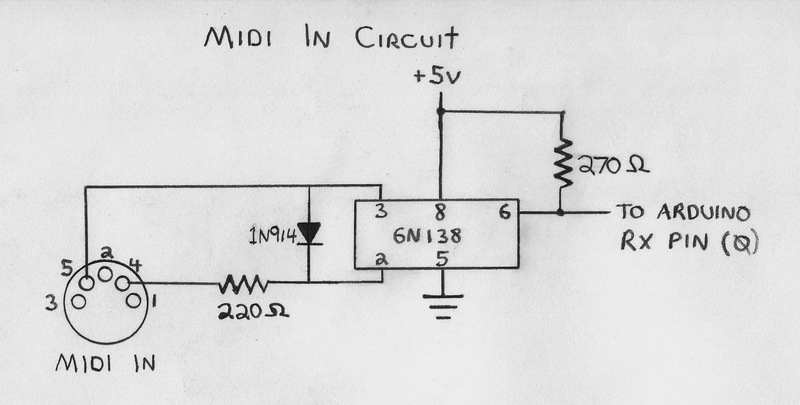 The MIDI specification recommendeds a circuit for the ports and calls for an opto-isolator. The reference design specifies obsolete Sharp PC-900 which currently substitued with the 6N138 IC (reference design is of TOSHIBA). The PC-900 or the 6N138 IC are called optocoupler or optical isolator. An opto-isolator (also known as optocoupler, photocoupler, or optical isolator) is an electronic component which transfers electrical signals between two isolated circuits by using light. This prevents high voltages affecting the system receiving the signal. We have seen such optical isolators to be used on 4 channel relay. For easiest connection, we need an 220 Ohm resistor, one MIDI jack, jumper wires, breadboard and one USB MIDI adapter. We need some headers to solder with the MIDI jack’s pins. MIDI jacks are easy for wiring – middle one ground, left hand side data pin (digital pin of Arduino, like pin 1 – RX), right hand side +5V with a 220 Ohm resistor in-between. options. Also change the base octave setting in the main window to 2. There are MIDI Note Tables with corrosponding hex values. This Article Has Been Shared 8852 Times! We Can Create an Arduino LDR Module With Transistor in Easy Way to Print Response as Either Zero or One. Here is Information About Arduino 14 Segment LED Display Driver IC & Library. As it is less used component for higher price, possibly you have build module yourself. Here is Arduino e-Paper/e-Ink Buying Guide. e-Paper Still Costly, Offers Slower Refresh Rate, Yet it is Great For Some Project Where Paper Look Adds Beauty. Cite this article as: Abhishek Ghosh, "Arduino MIDI Input & Virtual MIDI Piano Keyboard," in The Customize Windows, December 5, 2018, April 21, 2019, https://thecustomizewindows.com/2018/12/arduino-midi-input-virtual-midi-piano/.